Hello there friends and happy Saturday to you! We’re still off on our camping adventure! Don’t you just love that we have technology that works in the great outdoors? We are actually in a very nice camper. I might not be so inclined to be up writing posts at this time of the morning in a tent right??? I think this is a very country chic greeting card. The focal image reminds me of a seed packet. Not that I should know what that looks like as I can’t grow things to save my life lol. I pulled perfectly coordinating flowers from my stash of Wild Orchid Crafts Chrysanthemums and tucked in a few handcrafted flowers to fill in the arrangement. 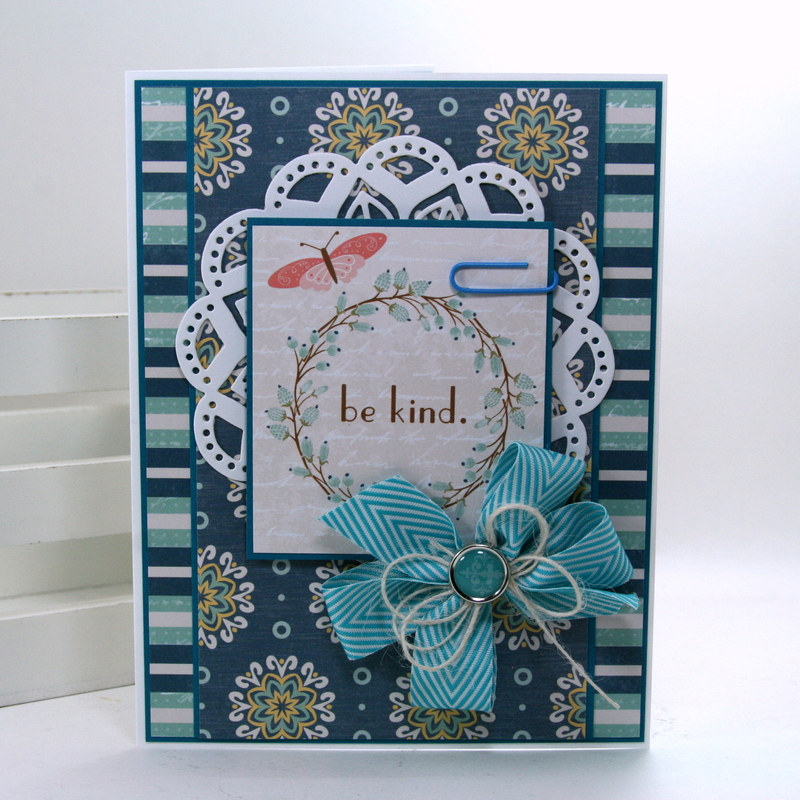 There’s a generous amount of die cut foliage as well as some pretty stitched satin ribbon and burlap string. This combination of florals and plaid and wood grain is just as sweet as can be and adding the crisp white die cut doily and coordinating sequins really dresses it up. Really Reasonable Ribbon~Chrysanthemums, Delicate Stitched Satin Aqua, Ivory Burlap String. Hello there friends and happy Friday to you all. I’m coming to you for our lovely campground in the National Forest in the fabulous sate of Texas. Yes even whilst roughing it I can share some crafty inspiration. This color combination is really in my wheel house. I so love shabby chic. To keep it from looking tooooo light I used a chocolaty brown cardstock. This also helps to anchor the text in the journal card. You always need a garden full of flowers for shabby cards and this one has lovely Wild Orchid Crafts flowers with die cut leaves and little loopy twine bows. Subtle details are just right for shabby cards so I’ve included some pearly bling, and a coordinating clip. 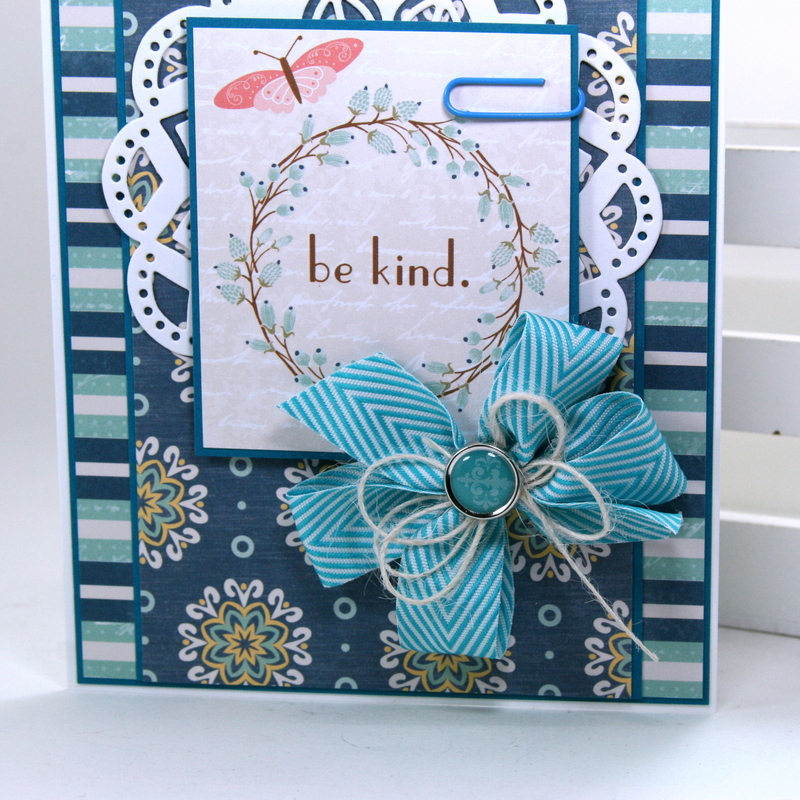 This bow created with burlap ribbon adds a gorgeous texture. I’ve topped it with an additional twine bow and antique button. To fill in this arrangement I’ve tucked in a tag and a white die cut doily. Really Reasonable Ribbon~Burlap Center Stitch in Pink, Ivory Burlap String, White Magnolias, English Roses, Sweetheart Blossoms. Hello there friends and crafty peeps! We are enjoying the lazy days of summer here in Michigan and the hot weather has inspired me to create a mini album for documenting those memories. What better collection than Summertime? 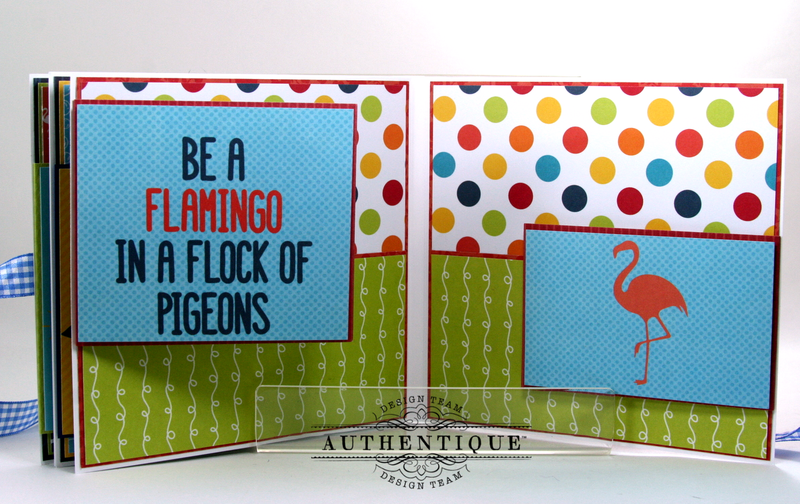 It has rich bright colors and whimsical images perfect for fun times. That striped paper reminds me of cushions for a beach chair. 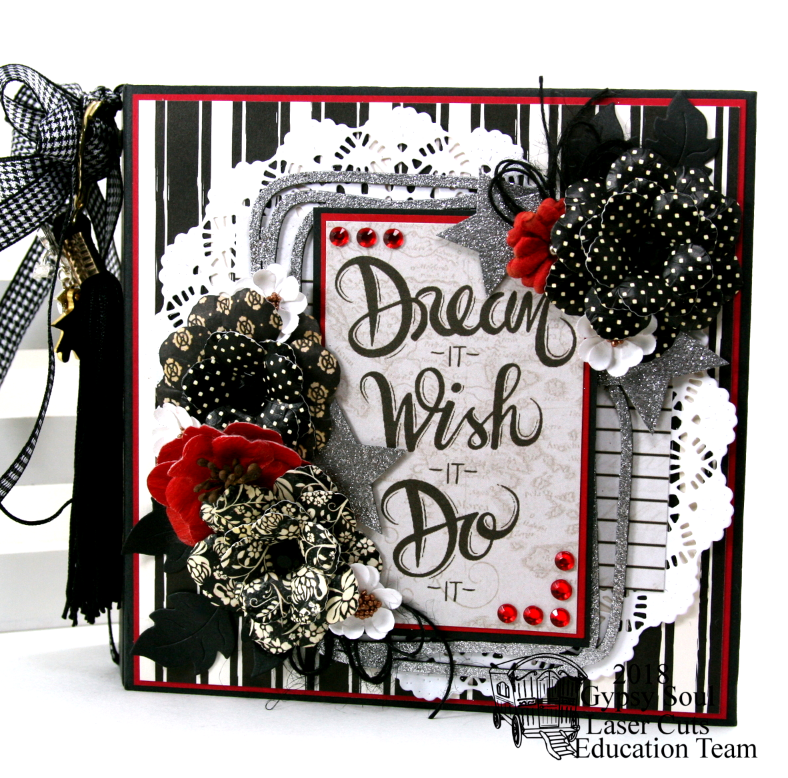 I fussy cut many images from the journal cards and created my own embellishments. I used a small acrylic envelope filled with sequins as a bit of a faux shaker. There’s a die cut doily tucked in to separate the busy paper patterns and an additional die cut in the form of a banner to add extra detail. I’ve got a few ready made flowers mixed in with ones I created with the Spectrum Cardstock to coordinate. There’s a generous length of plaid ribbon to tie the book up and a few sequins for extra detail. 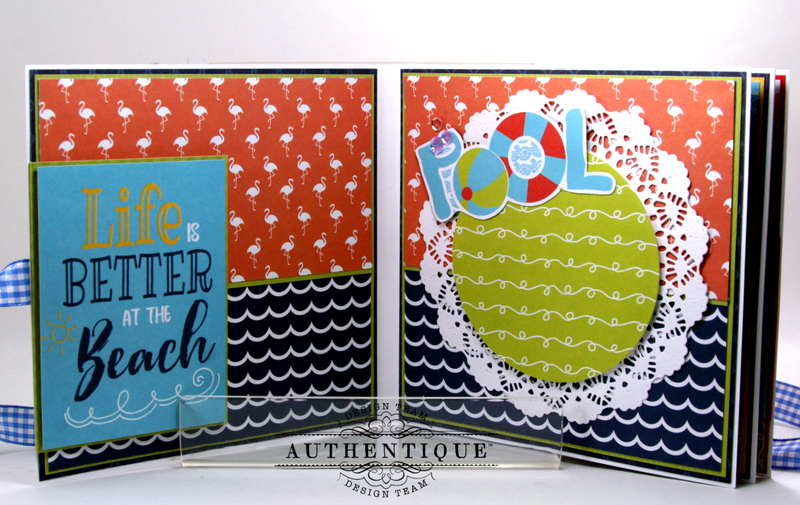 Inside the pages have combinations of the patterned papers matted with a nice matching cardstock. 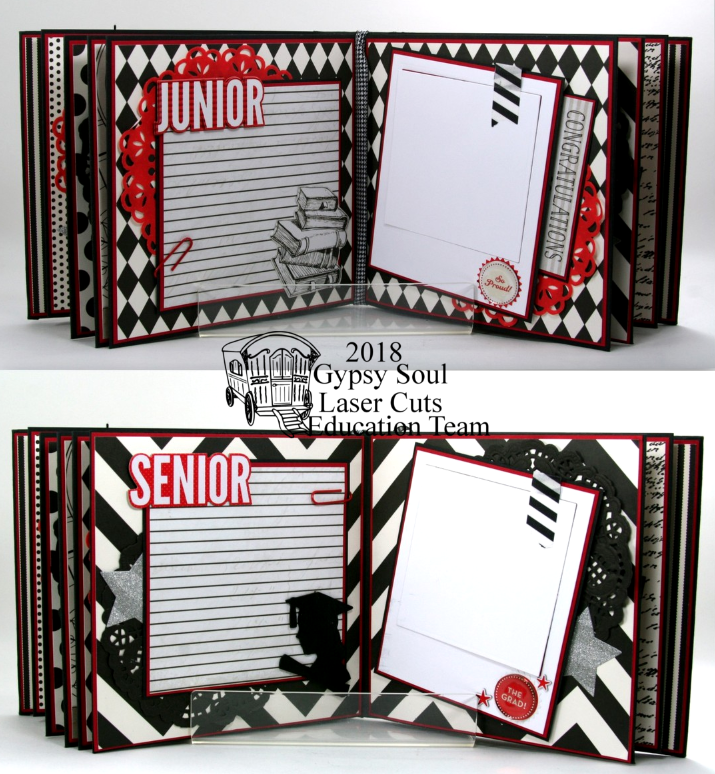 Tip ins provide loads of extra space for pictures and journaling. These pages have raised sections for pictures. I always include clips so pictures or mementos can be added without having to adhere them in case there is writing on the back. 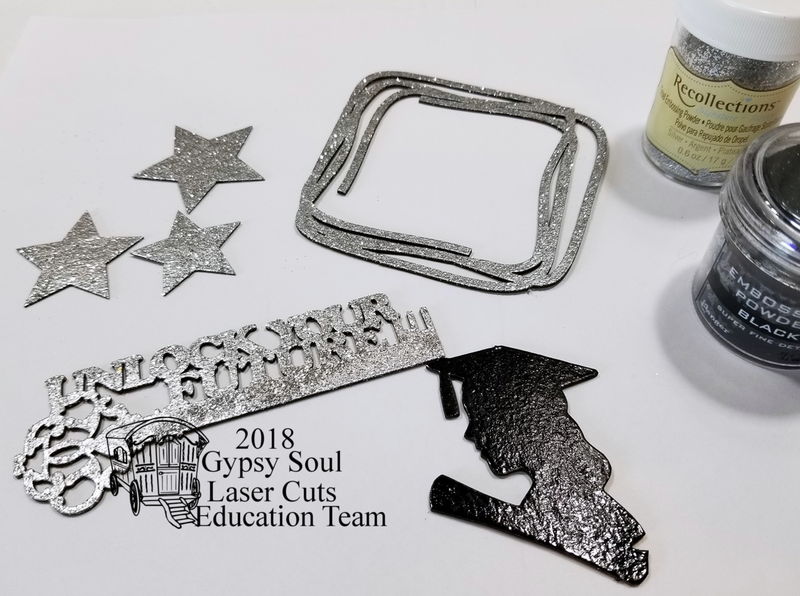 I utilized a larger cut apart for these tip ins. Simply by cutting it I was able to have a coordinating card for each page. 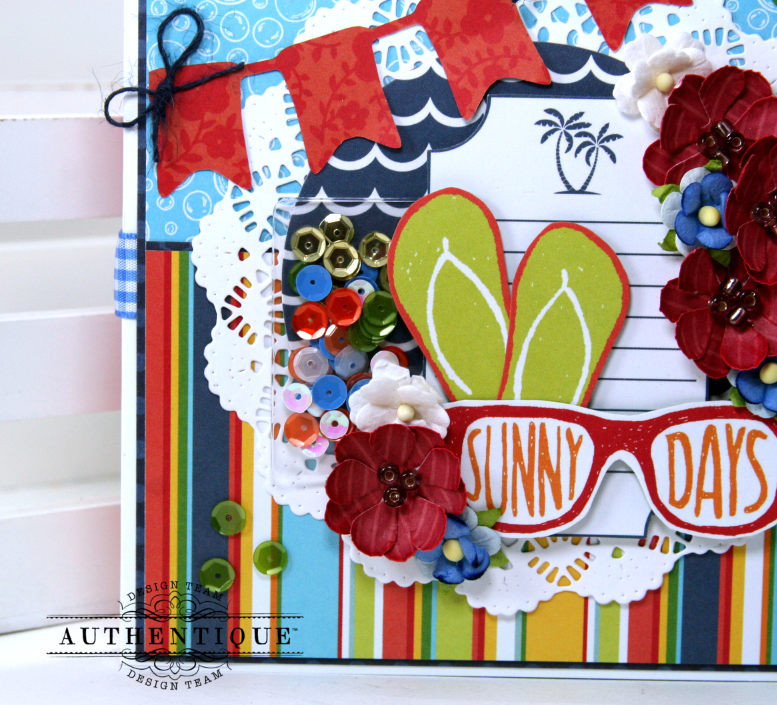 Please enjoy this flip through video with a tutorial on how I created the book base…..
Additional Supplies: Flowers, Sequins, Ribbon, Twine, Acrylic Pocket, Die Cuts. Really Reasonable Ribbon~Capri Blue Plaid Ribbon, Navy Burlap String, Blue Sweetheart Blossoms. Hello there friends and crafty Peeps! I’m sharing a card today that is a bit out of my comfort zone. 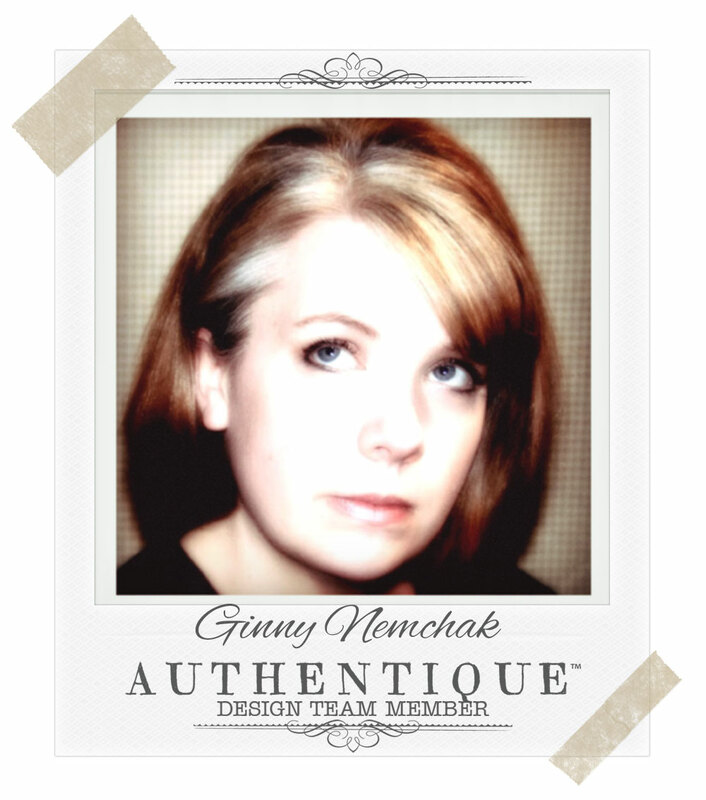 I’m using natural colors instead of shabby chic. I know it’s freaking me out too! Even though it’s not my go to color combo I’m very pleased with how it turned out. I’ve gathered Burlap String and pretty coordinating flowers to fill in this arrangement. Hello and happy Sunday to all my friends and crafty peeps! I’m sharing a mini album today that I created for a very special person. We are so proud of her for her achievements! Not only has she excelled in academics but also in sports and service to her community. Of course I’m talking about my Son’s girlfriend Lexi! I’ve decorated the cover with altered chippies from GSL finished to coordinate perfectly with the patterned papers. Here’s a close up at the chippies…. First I selected just the right shapes for the project then wiped them down with a damp cloth to prepare them for finishing. First they were dabbed with an adhesive to adhere the embossing powder then heated to set the finish. 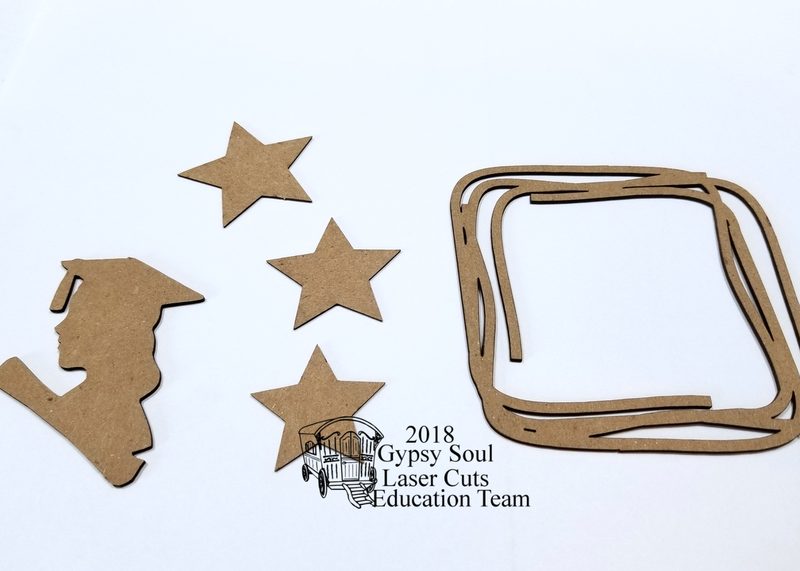 Gypsy Soul Laser Cuts~ Graduation Shape Set, Scribble Frame, Deco Stars. 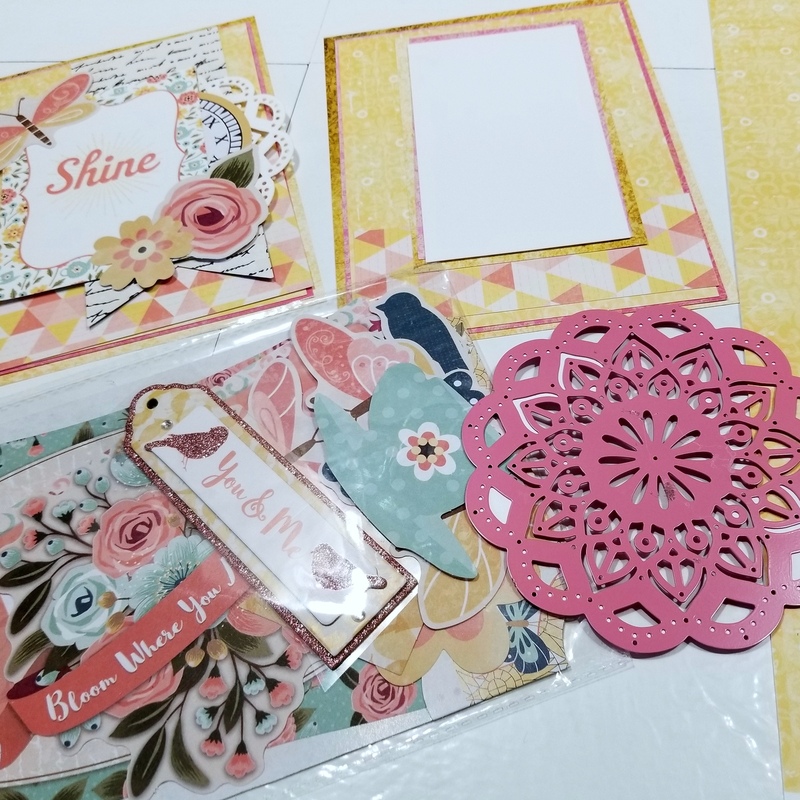 Please enjoy this flip through video we’ve prepared of this mini scrapbook album…..
You can find loads of crafty inspiration at Polly’s Paper Studio on YouTube. Really Reasonable Ribbon~Black and White Houndstooth, Black Burlap String. Hello there friends and crafty peeps! Wishing all of you a happy Saturday : ) I’m taking a little break from our camping trip to share this very vintagy sewing themed greeting card. I love all things crafty so when I can incorporate multiple hobbies like paper crafting and sewing I just can’t but help to be super happy. This Stitches collection from Authentique has so many gorgeous patterns and cut aparts. I’ve also added a border sticker from the collection as a faux sewing line. I created all these flowers on our last camping trip. What can I say…campers gotta craft. There’s a lovely altered chipboard frame layered in all the paper pretties. 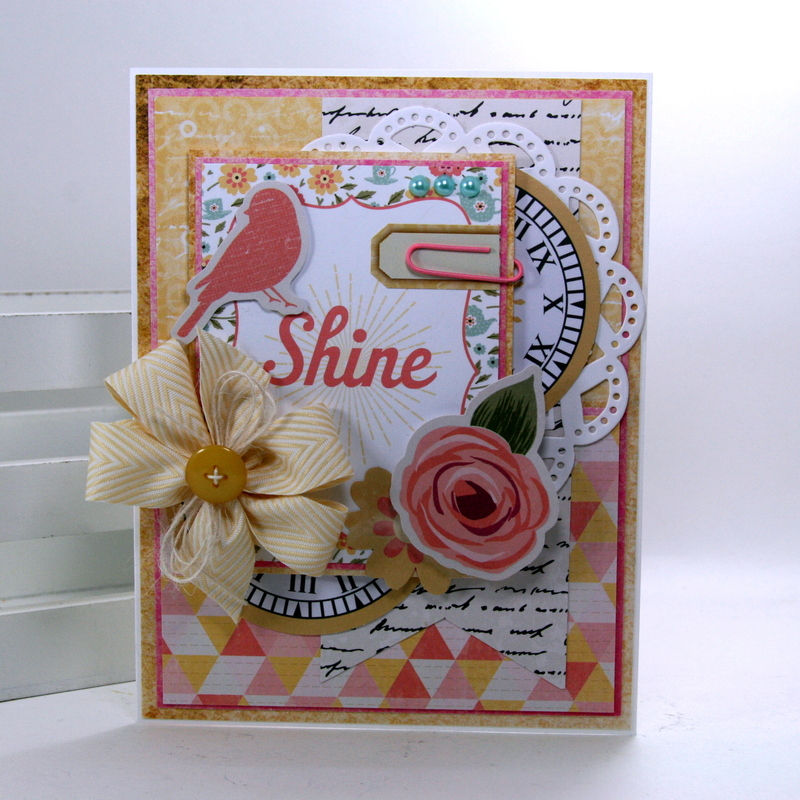 I’ve got a shabby pink embossing powder added and heat set to create a gorgeous finish with just a bit of texture. You can’t make a sewing themed card and not add ribbon and twine and a vintage button am I right? Really Reasonable Ribbon~ Pink Wrinkle Ribbon, Ivory Burlap String, Francis White Crocheted Lace. 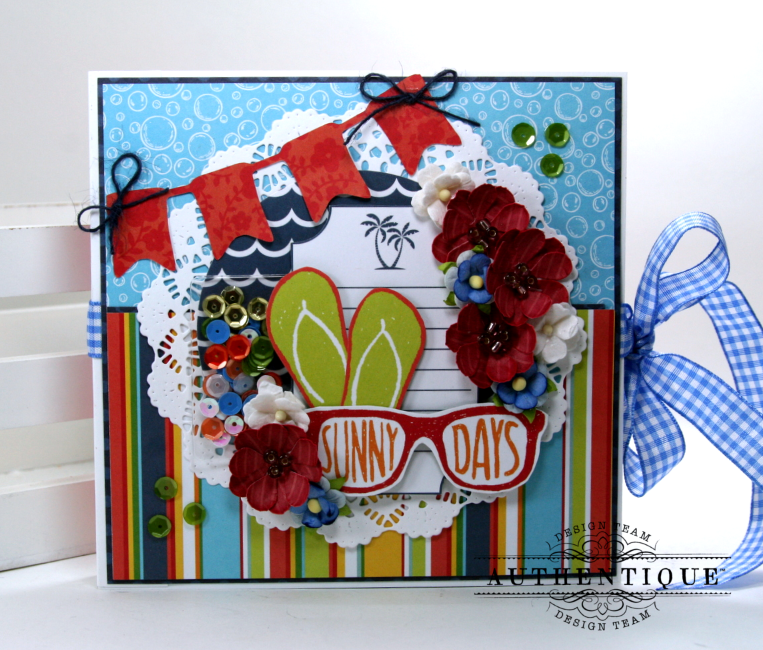 Hello there crafty friends and BoBunny fans! It’s a glorious day out. 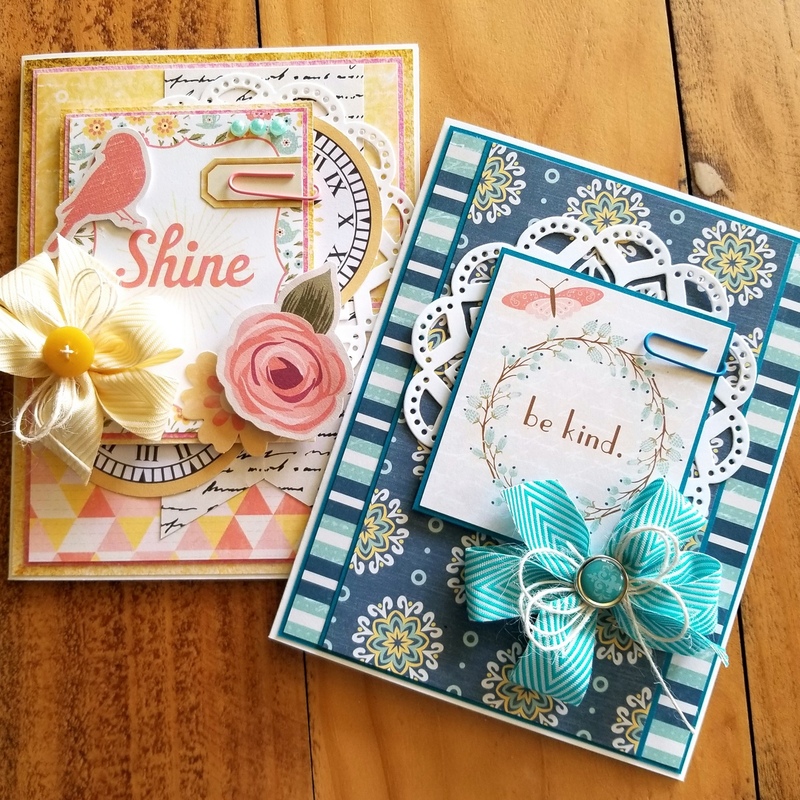 The sun is shining, the birds are singing, and I can’t help myself but to make cards with the wonderful Early Bird Collection. Not that you need a nice day out to enjoy Early Bird as it comes with it’s own sunshine! Such a cheerful color scheme, sweet images, and thoughtful, kind sentiments. Of course I made two. How can you not when you get this collection out? I could makes cards all day!! This is not a color combo I usually work with…but I knew it would look great because it was already there in the fun cheeky triangly patterned paper. 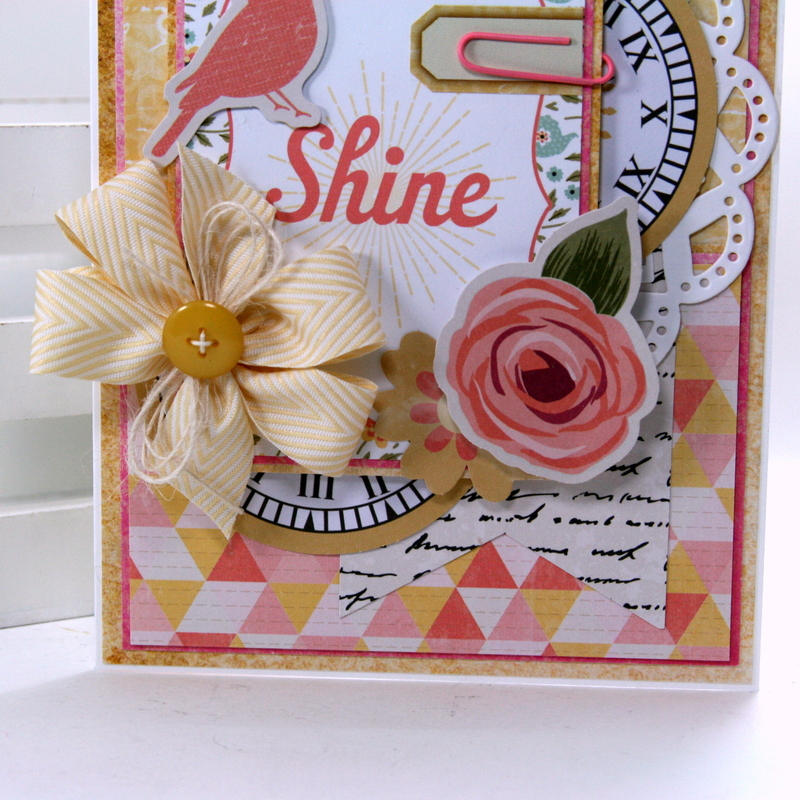 There’s a die cut doily layered in and a fun clock image from the Noteworthy collection. I used foam to pop up the focal image and added detail with a sticker, jewels, and a coordinating clip. To get a little more mileage out of the clock die cut I snipped it in two and worked the second half under this sweet poofy chevron bow. Since I knew the pink and yellow already looked great together I went for a double layer of matting using the Double Dot cardstock. I just love getting all the paper pretties out and mixing and matching them to my hearts content. So many possibilities!!! This second card was a snap to put together. 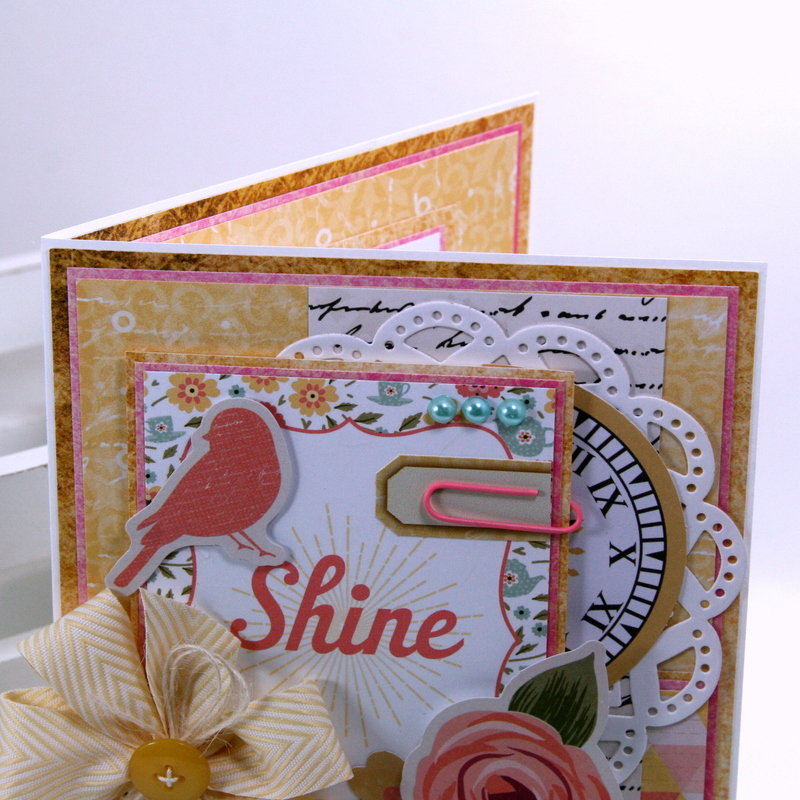 That lovely sentiment on the journal card was the inspiration…. I pulled the paper patterns to match. 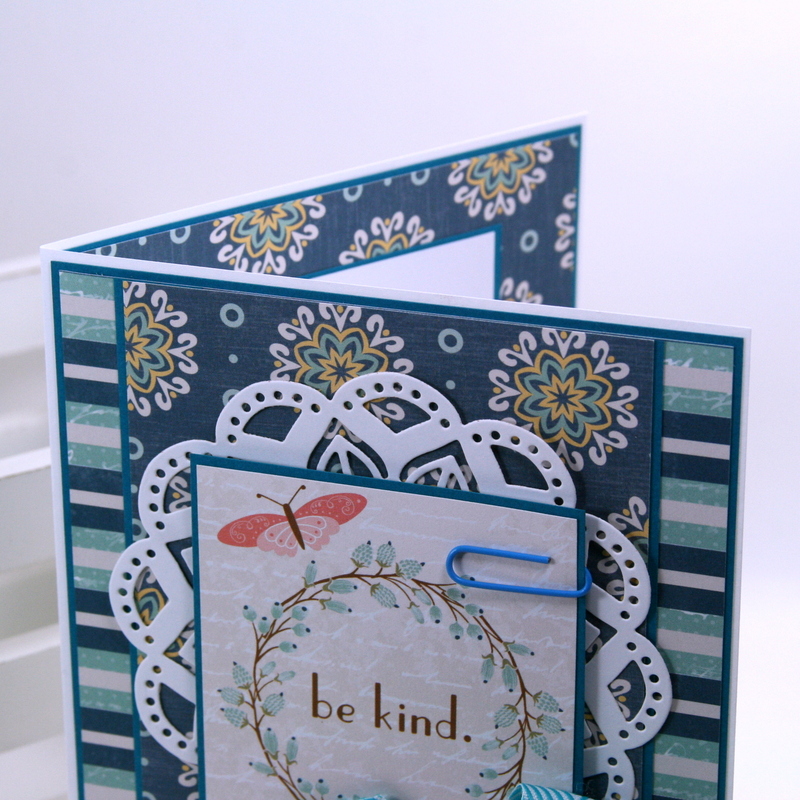 It makes a card really special when you finish the inside with coordinating patterns. Don’t forget to include a spot to add a sentiment. I finished off the bow with a Double Dot Brad. All you have to do is separate the prongs a bit then you can wrap the metal around to the back and secure. Really Reasonable Ribbon~Turquoise Chevron Stripe on Twill, Champagne Chevron Stripe on Twill, Ivory Burlap String.